1- Packing with a 4 1/2 year old who is very interested in EVERYTHING you take off the bookshelf or out of a drawer is not as easy as one might think. Nor does it move as quickly as one would like. 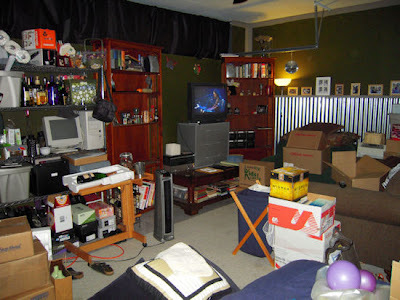 2- One can accumulate a TON of stuff in the space of two years. Even when one thinks she has been really good about throwing away the "unnecessary things." 4- If one looks at something and thinks, "this should go in the garbage," one really ought to throw it in the bin immediately. 5- The amount of beer a person drinks while packing is directly proportional to the number of boxes packed, however, the amount of work accomplished, is inversely proportional. 6- Blogging is also not conducive to box-packing. 7- I may need a "shoe whores anonymous" group... if not for the shoes, then for the books. 8- Mentally planning barbecues and dinner parties is NOT packing, nor is it any kind of actual moving preparation. It is, however, great for procrastination. 9- Packing 10 half-full bottles of booze is less fun than drinking 10 half-full bottles of booze... although, I'm sure the hangover is nearly the same. 10- Things WILL be chaotic and messy. Get over it. You are moving!! Yay!! I'm not even going to mention the other distractions in the house. Me...my dogs..ME... and instead i am going to suggest you blame it all on the TV. They are so distracting! Just remember, an empty beer bottle is one less thing to pack. Love no. 10. That's perfect. You can do it!